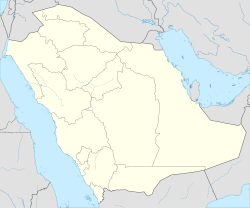 Afif (Arabic: عفيف‎) is a ceety in central Saudi Arabie, in the Najd region. It is locatit at 23°54′36″N 42°55′13″E﻿ / ﻿23.91000°N 42.92028°E﻿ / 23.91000; 42.92028, an is situatit approximately hauf-wa atween Riyadh an Mecca. The modren toun wis established in the 1910s as a hijra, or "settlement", for the nomadic tribes o the aurie, pairticularly the tribe o 'Utaybah (see Ikhwan). It haes syne then grown intae a smaa ceety o some 90,000 fowk, no coontin the surroondin touns an veelages, which thegither wi 'Afif form the 'Afif Govrenorate. This page wis last eeditit on 10 Mairch 2018, at 22:03.